Disclosures: I received a free copy of this book from the publisher in exchange for an honest review. I am also happy to say that Jeremy is a friend. I once drove 144 miles, one way, to have coffee with him in Lubbock, Texas. Finally, our family has financially supported both the Courtney family and the medical efforts of The Preemptive Love Coalition. Following, is the review I recorded at Amazon.com. 1. It focuses on something that every heart longs for: Love. The Courtneys and their crew give us a candid view of taking risks to love others. Yes, their efforts in a dangerous place that may be inaccessible to most, but their story illustrates and gives hope to those who wonder what it means to love others – even in less hostile environments. Even if I can’t go there and love like they do, can I love here like they do there? Yes! That’s one encouraging message from this book: We can practice preemptive love wherever we are! 3. It is hopeful. In a world that is clearly broken, the Preemptive Love Coalition gives us hope that Jesus’ love and loving like Jesus can make a real difference. The stories Courtney tells of pain and suffering, of distrust and betrayal, of racism and hatred bring tears of brokenness and sorrow. BUT the stories also bring tears of hope and joy as they reveal how living and loving like Jesus brings comfort to the hurting, alleviates suffering, builds trust, extends forgiveness, and embraces the other and does good for them. 4. It is well written. Jeremy is a great story teller who helps the reader feel the sweltering summer heat, taste the sweet tea, smell the cigarette smoke that hovers over the negotiations for permission to help and partners to pay, grieve the death of a child, and feel the fear and anxiety of parents whose kids are without medical hope in a country devastated by war and politics and ethnic/religious divisions. I cried. I smiled. I praised God for helping PLC make a difference. I wholeheartedly recommend this book to those who simply want a good read, to those who want to see what love in action looks like, to those who are interested in the Middle East, to those who are interested in intercultural relations, and to those who want to see transparency, honesty, and hope. This is Abu Sa’ad. We recently met in the Old City of Jerusalem. He initiated our meeting by doing a few things that no one has ever done to me in the Old City: First, as I was chimping the photos I had just shot, he stuck his head over my shoulder to see what I was looking at. He seemed to appreciate the shots (which may appear here at some point in the future), and gave me an open door to speak. I tried to use some of my newly acquired Arabic, which went pretty well. I told him that I was learning Arabic and he was happy to engage in small talk with me. Mostly he told me about himself like where and when he was born: His identity card says he was born in 1926, though he insists it was really 1925. He also showed me his business card and made a little more small talk before moving along. When he was about 25 yards from me, it dawned on me that he was going the same way I was going, and that I might be able to get up ahead and snipe a shot of him. So I gathered my things and tried to get ahead of him. However, I attracted his attention as I tried to pass him in the narrow alley, and he started to talk to me again. Then he did the second thing that has never happened to me in the Old City: He asked me if I wanted to take his picture. In elementary Arabic, I clarified if he had just asked if I wanted to take his picture. I had understood him correctly, and happily said yes. He struck a pose and waited patiently as I made a few adjustments and openly took the shots I had hoped to snipe. After I took the photos, we continued to walk together for about 5 minutes. As we talked, he revisited the year of his birth with me, even showing me his identity card to verbally correct the date that was shown there. 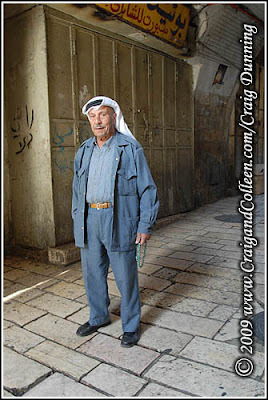 I asked him where he was going and found out that he prays at Al Aqsa Mosque every day. I asked how many times he prays there each day, but his answer was long and drawn out and not understood by me. We talked about the prayer beads he was carrying, but I didn’t really understand what he said about them either. I did the best I could, but didn’t understand much of what was said. However, I did enjoy seeing that the new words I was using were understood by my new friend. I hope that as my language skills improve, I’ll see Abu Sa’ad again. I’m sure he is filled with interesting stories, and I want to understand some of them. I dropped my daughter off at school at 07:30, ninety minutes before my Arabic class was scheduled to start. I say, “scheduled to start” because we have yet to start on time, or even close to time. Never mind, we usually go over at the end, so I guess I’m getting all I paid for. I enjoy wandering around the Old City for lots of reasons, but one of them is that I get a chance to use my Arabic as I’m gaining it, little by little. This time, I was in the Old City earlier than usual and found myself in the company of a friendly man. I told him that I was studying Arabic and he was all too happy to speak (much too fast) to me in Arabic. The conversation started fairly normally: “Where are you from?” he asked. “Jebal Abu Gneim,” I said, offering the Arabic name of my “settlement.” In my thinking, that’s a little olive branch toward those who might be offended that I live in an area that is considered by many to be stolen land. We were both surprised to discover that we are neighbors: he from Um Tuba, I from Har Homa (Jebal Abu Gneim). Two villages sitting next to each other, one Arab, the other Jewish. One considered native, the other considered a settlement. However, he didn’t seem worked up about where I live. In fact, he was impressed that I know of his village, Um Tuba. I did have an idea that my new friend wasn’t being complementary about President Bush, but I wasn’t certain how badly he thought of the former President. After a few moments of dead time gazing at each other, he said it again, but with less Arabic and more – can I say this? – Hebrew. In this part of the Old City, most men seem to be able to speak Hebrew, but they want to do it in whispers, so that others don’t hear them. I’m totally fine if they speak to me in English, but they tell me (in a whisper, of course) that they are more confident in their Hebrew than their English. Anyway, he began to use the story of Cain and Abel from the Quran to explain what he meant. Because I didn’t catch “Cain and Abel” in Arabic, he offered them to me in Hebrew, so it took him longer than he had hoped it would to get me on track. “Cain who killed his brother Abel,” he clarified, “also had a gold brain and black heart.” And with that, his assessment of President Bush was finished. I’m not sure if he felt the freedom to share his assessment of President Bush because we are neighbors, or because I’m learning his language, or simply because I was willing to listen. I suppose it is open to a variety of interpretations as to exactly what he meant. But, I didn’t pursue it because long ago, I stopped being defensive of the President of the United States, whoever may be President. I don’t see much, if any value in going down that road. I do want to understand better what people mean, and find that Arab men that are older than me often use word pictures that they think will clearly communicate to me, but actually only puzzle me. After the “gold and black” thing, he insisted we have coffee. Now, I don’t drink coffee. Let me say that again, but more clearly: I DON’T DRINK COFFEE. More than once, I’ve explained to people, “I’m not being modest by saying no; I REALLY don’t like coffee. I don’t like the taste, and it usually burns my tongue.” Well, no matter: out came the thick coffee in the thimble size cups. I went ahead and accepted it since I didn’t really have a choice at that point. I held it for a moment and then took the smallest micro-sip possible, valiantly fought off the natural reaction toward severe bitter tastes, and swallowed the unbelievably rancid brew. After that, I just held the cup in my hand with NO intention whatsoever that it would come near my mouth again. He was happy to see that I enjoyed his coffee, which is to say that I must have had better control of my facial gestures than I thought possible. He needed to get going, so he bid me a “mah-salami” (“see you later”), but didn’t get away before I had him write his name out for me. I hope to wander over to his village on a Saturday or Sunday to visit. But, I’ll make sure it is time for tea, not coffee. It seems to me that there are three major currencies among Arab men: coffee, cigarettes, and politics. Unfortunately, I don’t care for any of the three. However, I’m hopeful that my Arabic studies combined with Arab hospitality will give me some good in-roads into this community.